Rugged virtually unbreakable mobile cart that is just right for easy handling in dozens of uses. 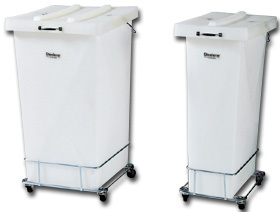 Ideal for storing and transporting chemical, food ingredients, soiled linens, etc. Made of tough all steelene polyethylene, molded container with attached polyethylene cover -- easily removable from plated dolly for cleaning. Dolly is complete with 2" dia. for easy rolling (optional 3" dia. casters available). FOB Shipping Point. Product No. Cap. (gal.) Cap. (lbs.) L x W x D Wt. (lbs.) Price Ea.